Q: What is thorium and what makes it special? A: Thorium is a naturally-occuring mineral that holds large amounts of releasable nuclear energy, similar to uranium. This nuclear energy can be released in a special nuclear reactor designed to use thorium. Thorium is special because it is easier to extract this energy completely than uranium due to some of the chemical and nuclear properties of thorium. Q: What is a liquid-fluoride reactor? A: A liquid-fluoride nuclear reactor is different than conventional nuclear reactors that use solid fuel elements. A liquid-fluoride reactor uses a solution of several fluoride salts, typically lithium fluoride, beryllium fluoride, and uranium tetrafluoride, as its basic nuclear fuel. The fluoride salts have a number of advantages over solid fuels. They are impervious to radiation damage, they can be chemically processed in the form that they are in, and they have a high capacity to hold thermal energy (heat). Additional nuclear fuel can be added or withdrawn from the salt solution during normal operation. Q: Are the salts safe? A: Very safe. Unlike other coolants considered for high-performance reactors (like liquid sodium) the salts will not react dangerously with air or water. This is because they are already in their most stable chemical form. Their properties do not change even under intense radiation, unlike all solid forms of nuclear fuel. Q: Have liquid-fluoride reactors been built before? A: Yes, two liquid-fluoride reactors were built at Oak Ridge National Laboratory in Tennessee in the 1950s and 1960s. These were small research reactors that were built to test the fundamental principles of a liquid-fluoride thorium reactor. The first, which was called the Aircraft Reactor Experiment (ARE) ran for a week in 1957, and the second, the Molten-Salt Reactor Experiment (MSRE) ran between 1965-1969 and validated many of the principals of the fluoride reactor concept. Q: How does a liquid-fluoride reactor make electricity? A: Fission reactions take place in the fuel salt, making it hotter. This heat is transferred to a coolant salt outside of the reactor. The coolant salt is then used to heat gas that turns a turbine, which turns an electrical generator, generating electricity. Q: What is nuclear waste and how does a liquid-fluoride reactor address this issue? A: So-called “nuclear waste” or spent-nuclear fuel is produced in conventional (solid-core) nuclear reactors because they are unable to extract all of the nuclear energy from their fuel before they have to shutdown. LFTR addresses this issue by using a form of nuclear fuel (liquid-fluoride salts of thorium) that allow complete extraction of nuclear energy from the fuel. Q: What advantages does a liquid-fluoride thorium reactor offer a utility? A: Unlike a pressurized-water or boiling-water reactor, a liquid-fluoride thorium reactor operates at high temperature and low pressure. Its high power density means that the reactor vessel itself is much s maller and lighter than an LWR reactor vessel; small enough, in fact, to be mass-produced in a factory rather than constructed onsite. Its inert-gas coolant does not boil in the event of a loss of pressure, and the fuel, blanket, and coolant salts do not react with air or water. All of this means that the containment building of a fluoride reactor can be much smaller than the containment of a light-water reactor of similar power output. Q: What’s the difference between a “fast-spectrum” reactor and a “thermal-spectrum” reactor? The basic idea behind nuclear fission is that you can use an electically neutral particle, the neutron, to destabilize a nucleus and cause it to split. This is a big deal because it’s very difficult to get charged particles, like protons and electrons, anywhere near the nucleus–they’re repelled by electrical forces. That’s the basic reason why nuclear fusion is so difficult. But with the neutron, it’s a different story. It just waltzes right up to a nucleus and hits it, and the nucleus never saw it coming. Here’s an animated gif of how fission works, and a little movie too. Now the speed of the neutron when it hits the nucleus has a lot to do with how likely a fission is to occur. One might think, intuitively, that if the neutron is going really fast that it has a better chance of “shattering” the nucleus, but that’s not really how it works. Actually, for the fissile nuclei (such as U-233, U-235, and Pu-239) the SLOWER the neutron is going, the more probable fission is. So you want slowed-down neutrons to maximize fission. And then from fission comes more neutrons, which continue the reaction. Well, mostly right. Actually, the neutrons borne from fission are going really fast. Really, really fast. And they have to slow down to have a good chance of causing fission. That’s where the moderator comes in. The moderator in a nuclear reactor is the material whose job it is to slow down neutrons without absorbing them. This slowing-down is done by neutrons bouncing off the nuclei of the atoms in the moderating material. For most reactors, moderation takes place in the water that also cools the reactor. For a high-temperature reactor like the liquid-fluoride reactor, graphite (carbon) is used as the moderator. The neutrons are born from a fission reaction, bounce around in the moderator, slow down, and then cause another fission reaction. This “bouncing-around” process is also called “thermalizing” the neutrons, because by bouncing around in the moderator, the neutrons are brought to the point where they have the same thermal energy as the surrounding material. This graph shows how likely a fission reaction is based on the speed (kinetic energy) of the neutron that strikes the nucleus is. Cross-section is a concept that corresponds to the probability of interaction–the larger the cross-section, the more the probability of interaction. The energy of the thermalized neutron corresponds to temperature. If a neutron were at the same temperature as the room you’re in (~300 K), it would have an average energy of 0.025 eV. Not very much. If the neutron instead were at the same temperature as the hot fluoride salt in the center of a liquid-fluoride reactor (~1000 K) its average energy would be 0.086 eV. Not much more. When neutrons are born from the fission reaction, they have energies around 2,000,000 eV, which corresponds to a temperature of 20 billion degrees! That’s much hotter than the center of the Sun! But like hot water poured into snow, when neutrons are that much hotter than their surroundings, they lose energy fast. And most all of that energy is lost through collisions with the nuclei of the moderating material. So a “thermal-spectrum” reactor is a reactor that has been arranged in such a way so as to optimally “cool” the neutrons so they can cause fission. And as can be seen from the graph, fission is hundreds of times more likely when neutrons are “cooled” down by thermalization/moderation than when they’re “fast”. So it’s logical to ask at this point, why would anyone want to build anything but a thermal-spectrum reactor? It would seem to have the minimum amount of fuel requirement for a reactor, and it would seem to maximize your chances of getting nuclear reactions. And indeed it does. But there is more to the story. Uranium is an interesting substance, consisting overwhelmingly (99.3%) of an isotope, uranium-238, that is not fissile. But if uranium-238 captures a neutron it becomes plutonium-239, which is fissile. One more neutron into the plutonium and you get a fission reaction and energy. So you can imagine that it takes two neutrons to “burn” uranium-238. But there is a very small amount of uranium (0.7%) that consists of the isotope uranium-235, which is fissile and only requires one neutron to fission. Despite constituting such a small fraction of uranium, this U-235 is where nearly all of our nuclear energy comes from today. And the fact that we are burning up this small resource is one of the basic reasons that our nuclear infrastructure is not sustainable. It’s also one of the basic reasons that today’s reactors make so much nuclear waste. So couldn’t we just burn up the U-238 after the U-235 is gone? Well, to do that, we need to make sure that the fission of Pu-239 (which is what U-238 turns into after it absorbs a neutron) gives off at least two neutrons–one to convert a new U-238 into Pu-239, and another to fission that Pu-239. So how many neutrons does the fission of Pu-239 give off? Well, it all depends on the energy of the neutron that the Pu-239 absorbs. Here’s a graph showing the relationship. Now this graph shows two lines. 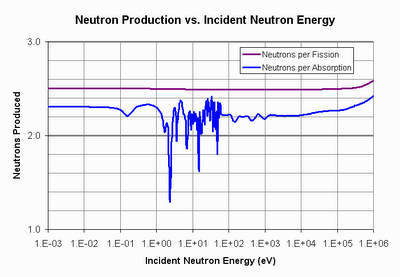 One is the line in purple that shows how many neutrons are given off from a fission in Pu-239. As you can see, it’s pretty constant across energies–nearly three neutrons emitted per fission. That seems to indicate there will be plenty of neutrons for fission, conversion, and even some to spare. But the blue line tells a different story. 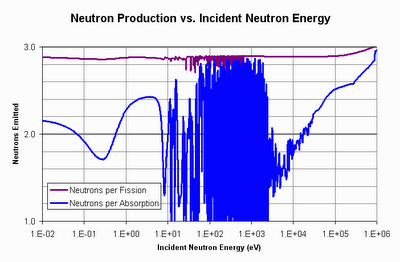 The blue line is the number of neutrons given off per absorption in Pu-239. Why are they different? Because Pu-239 has the unpleasant habit of sometimes just absorbing the neutron that struck it, and not fissioning. This happens more often when the neutron it absorbs is at the slowed-down, thermal energies. The fact that plutonium-239 likes to eat thermal neutrons and not fission has tremendous implications for our energy future. At thermal neutron energies, the effective number of neutrons given off per absorption isn’t enough to sustain “burning” of U-238. You can see the line dip and weave around the magic 2.0 number at thermal energies (the energies at the left-hand side of the plot). When you account for neutron losses and a number of other things that real reactors must deal with, there’s just not enough neutrons to go around. Here is the point where the road forks, where two paths present themselves, and one was taken, and the other effectively ignored. One path is thorium, the other path is the plutonium fast-breeder. But before I go too far, let’s talk about the path not taken–thorium. Thorium is about three times more common than uranium and consists of only one isotope, thorium-232. It has no naturally fissile isotope like U-235, and thorium is not fissile in and of itself. But like U-238, it can be converted into a fissile isotope (U-233) by absorbing a neutron. One more neutron absorption in U-233 causes fission. So again, we ask the question, how many neutrons does the fission of U-233 give off? Is it more than 2? More to the point, is it more than 2 per absorption? Yes, U-233 not only gives off more than two neutrons per absorption at thermal energies, it gives off significantly more than 2, which is enough to account for the inevitable losses that will occur in a real reactor. This means that a thermal-spectrum reactor can “burn” thorium in a sustained manner and doesn’t need to go to a fast-neutron spectrum. And that has tremendous advantages for safety, economy, and nuclear proliferation. Has anyone got information on the Indian thorium plant? Could you expand your answer to answer to “Are salts safe?”. 1. First is is obvious that anything that is 900 degrees is dangerous to a person. Have you ever been to steel mill? sure anything that is 900 degrees is dangerous, but it cools down! unlike radiation heat disperses pretty quickly. 2. Can you comment on the likely result if the hot salt is exposed to normal air? In the faq it says this "A: Very safe. Unlike other coolants considered for high-performance reactors (like liquid sodium) the salts will not react dangerously with air or water"
3. What is the like result of water exposed to the salt. I would think a giant plum of steam would result, but would it be radioactive? I dont know but the follow info from the faq seems to say no. but I cant say for sure, that is only "good" question you had. "They are impervious to radiation damage, they can be chemically processed in the form that they are in, and they have a high capacity to hold thermal energy (heat). Additional nuclear fuel can be added or withdrawn from the salt solution during normal operation." and "the salts will not react dangerously with air or water. This is because they are already in their most stable chemical form. Their properties do not change even under intense radiation, unlike all solid forms of nuclear fuel." 4. Does the hot salt react with concrete? how does hot steel react with concrete? As it turns out the question about water and fluoride salts was not as stupid as you thought. Salts must be extremely pure initially, and would most likely be continuously cleaned in a large-scale molten salt reactor. Any water vapor in the salt will form hydrofluoric acid (HF) which is extremely corrosive. I would expect LFTR to be designed using a helium cover gas to keep moisture away from the salts. So water could cause HF which eats the reactor vessel. That's a bad thing but not a danger to the public. Time for another chapter in the "Thorium Roundup." DOE has become enthusiastic about Small Modular Reactors (SMRs). Perhaps DOE should invest in *this* SMR design: Thorium-Fuel Molten Salt Reactors (TFMSRs), aka LFTRs. A functional prototype LFTR will be built by Flibe Energy, founded by thorium nuclear engineer, Kirk Sorensen, with a goal of 1 June 2015 for start-up, 50th anniversary of the first Oak Ridge MSR start-up. program for Thorium-Fuel Molten Salt Reactors (TFMSRs). Reps from the CAS visited Oak Ridge Labs last Fall (2010) to make a reality check, and have now decided to eat our collective lunch by going after the IP and patent rights to molten salt reactors. This is a true "Sputnik Moment" for U.S. energy development. factor of 1,000, and max storage time to 300 years. Think Boeing-style U.S. factories producing small (100MWe), modular, standardized TFMSRs for clean nuclear energy. So far the biggest Chinese energy investment is in 200 Westinghouse AP-1000 solid-fuel reactors to be built over the next ten years. Construction of each pre-fab AP-1000 will go from groundbreaking to on-line power production in 3 years (vs. NEVER for the US). CAS estimates 10 years to take the TFMSR from prototype to commercial reality. My estimate is 5 years for China to have a Boeing-style, pre-fab factory for TFMSR's producing one 100MWe generating station each week (Holton's generating capacity is 20MWe). Expect the AP-1000's to be cancelled in favor of TFMSR's which take at least 50% less money and land area to build, and they can be air-cooled or used for industrial heat. centuries. Meantime the US considers thorium a toxic nuclear waste (which keeps US rare-earth mines closed, and DoD at China's mercy) and has buried 3,200 tons of thorium "waste" in the Nevada desert. Plans are in place to spend $500 million to destroy the thorium stash in Nevada. Better to sell the 3,200 tons to China, OR let Flibe Energy jump-start TFMSR production in the US. Think jobs! That's 33% HF solution. The salt will not contain water- its converted from dried thorium oxide converted to metal and that's fluorinated. What do you specialists say to that? Where do those special radioisotopes referred in your presentations come from such as Pu238 during the operation of a LTFR? 1. Fluoride salts are the fuel of the reactor. The salt tested in the MSRE is FLiBe, a mixture of Lithium Fluoride, Beryllium FLuoride and contaminants such as Uranium 233 Fluoride, the fuel. Besides the temperatures and intense radioactivity, fluorides are chemically poisonous. Beryllium is poisonous. Also, Lithium salts are psychoactive drugs. You don't want to eat these things. However, they are inside five levels of containment because they are a reactor core. At normal temperatures, they resemble rock: The fluorides are solids that don't dissolve well in water. As for plant personnel, most sane reactor designs pump the salts through a heat exchanger, to move the heat to a less-poisonous medium that turns a turbine to make power (Kirk favors Helium). The salts are very safe within a reactor: They are immune to the three main damage mechanisms in a reactor core: phase change (melting or boiling), corrosion, and heat damage. 1a. They have very low vapor pressures, even at high temperatures, so they do not boil, and build up pressure. At high temperatures, the neutrons get above the fission resonance of U233, so the reactor can't run away. 1b, Molten ionic salts are immune to radiation damage: After a particle or something hits the chemical bond, the ions just bounce around and reform in the fluid. 1c, Since they are chemically stable fluorides, very little or nothing can break the chemical bonds of the salt. I.e. it can't corrode. @MartinBurkle,@JasonRibeiro: In air or water, FLiBe will cool to a rock-like substance. Fluorine is more chemically reactive than oxygen, carbon, hydrogen or calcium, so these can't break the bonds of the salt. Fluoride salts do not chemically interact with air, water or concrete. @MartinBurkle: Water doesn't dissolve most fluorides, including heavy metal fluorides. Water might entrain particles of salt. The whole point of a five-level containment is to keep the particles of salt inside. @MartinBurkle: Concrete contains water. Hot salt will cause it to spall. The salt will have no chemical reaction with it. : The corrosion problems in the MSRE are all known and fixable. See WASH 1097 and ORNL-4829, referenced above. @ChrisGentile: The ARE had a specific power of 80Kw/liter of salt. Agree with David; also China does not have the NRC issues, and is building one. provides a nearly identical comemrcial opportunity, but this is not well known. @SteveBurrows: Current large LFTR designs look like large, rectangular industrial buildings. The giant dome of light-water reactors is needed because in an emergency, they have to be able to passively cool steam from the core. @Ken: Chlorine is a larger, emptier atom than Fluorine. It slows neutrons a lot less. It's practical to make a fast-neutron reactor using chlorine salts, and therefore a chlorine salt reactor can fission Uranium 238, and the inconvenient even-numbered transuranic elements that make spent nuclear fuel hazardous for thousands of years. That is, it converts these into fission-products, radioactive waste that is dangerous only for about 300 years. @David: Yes, U233 is a nuclear fuel usable in a properly designed trigger. if the reactor is designed for this. Monitoring should be able to detect a shutdown. 109% per year and practical reactors can easily be less. power wants nuclear weapons, they can probably get them anyway. reluctant to adopt a technology abandoned by the U.S. I think this proposal would not pass licensing. I wouldn't want it to pass, myself. heat-exchangers now. The system is more complex than a NERVA. 3) Yes. The Radkowsky fuel concept is designed for LWRs. 4,5) Probably not; The even-numbered actinides need fast neutrons to fission. engineering costs: Larger units are -much- more expensive to prototype. The industry has settled on 1-1.5GWe units as being the most economical. E.g. this is the maximum size of commercial turbines. moderator lifetime. David LeBlanc has a simplified design that may solve this. decays below the level of natural uranium in about 300 years. The noble metals (Platinum, Palladium and Ruthenium, 20%) are useful as catalysts. Catalyst cost currently limits the size of fuel refineries. probably have to be buried. chemistry of the Thorium fuel Cycle. Could the salts in a MSR boil? What is the effect of uranium concentration and flow rate on salt temperature? In one of the videos, I saw Kirk explain the "Internal continuous recycling of blanket salt" section of the reactor diagram, but never saw an explanation of the "External 'batch' processing of core salt done on a schedule" section. Did I miss it? Does that part of the design present any exceptionally difficult technical challenges? One issue that I haven't seen a good answer on above is the question of corrosion in the piping. Would fluoride salt at 900° corrode the pipes in only a few years? I ask because in a recent talk with a graduate student at MIT, he said this corrosion issue is the fatal flaw of the LFTR. 900 C is probably to high for current materials, but the temperature could be lower than that. At least running on high grade Uranium corrosion can be controlled in the reactor itself. The reprocessing part is much more difficult: in parts the salt is a lot more corrosive due to higher fluorine content and other parts may need higher temperature or exposure to molten metals like bismuth. So I would expect parts of the reprocessing unit to last much shorter, with regular replacement. How and if the reprocessing works is one of the big open points – the reactor is easy and proven to work, reprocessing has several open questions. Capital cost per Mw of installed capacity? Operating cost per unit (KwH)? What is the minimum installed capacity to achieve economies of scale? Any prototype plant operational in the world?